As part of our ongoing partnership with Saf-fa South Africa, we have been exposed to a variety of sports stars in South Africa that we may never have met. One of those is the impressive Ryno Liebenberg. I sat with the impressive boxer and chatted to him about All Things boxing and sport in General. All Things Jabu (ATJ): Thanks for the time to chat. Your record now stands at 12-0 after your most recent victory, who is next for you? Ryno Liebenberg (RL): There is a possible rematch against Johnny Miller on the cards. I beat him last time, but he was unhappy, so I’m willing to beat him again! ATJ: What about future world title fights? RL: I am very keen to fight for a world title. The IBO points basis, means I am about 2 fights away from qualifying in the Top 20 and having enough points to have a go at a world title. ATJ: Having fought at various arena’s around the place already, which one is your favourite to fight at? RL: The centre of boxing in South Africa, Emperors Palace. The vibe at Emperors Palace is something special. ATJ: There is a lot of time between fights for professional boxers, how do you keep your self fit and busy in the times between fights. RL: Well, I am fortunate enough to work for Universal Paints. I wake up at 4 every morning and run and get off from 13:00 and come to Colin Nathan’s gym and train for the afternoon. ATJ: You are practising in a great gym, with Colin as a trainer, what is he like as a trainer? RL: Colin is the best trainer in South Africa. He puts in huge effort and time, both from a personal and a professional point of view. You may be alone in the ring, but with support like Colin there you know you aren’t really alone. ATJ: How do you prefer winning? RL: A win is a win, but obviously knock outs make things go a bit quicker. Knock outs come, I don’t really box for a knock-out. I train for 12 rounds and then if a knock out comes its great! ATJ: Which weight level are you in? ATJ: How physical does your training get? RL: Well in training we spar. Sparring gets much more physical than boxing itself and my nose is the way it is from sparring, not from boxing itself. We spend almost 150 rounds sparring before a fight. ATJ: What other sport are you interested in? RL: I love cars and motorbikes. I am very interested in Formula 1 and Moto GP, but as a fan not as a participant! ATJ: What about the boxing lifespan for a professional? RL: Its hard to say, but if you can get 5 years of fights. Obviously if you win, there are more fights and you get to cash in a bit. But if you start to lose, then you will struggle to get fights. 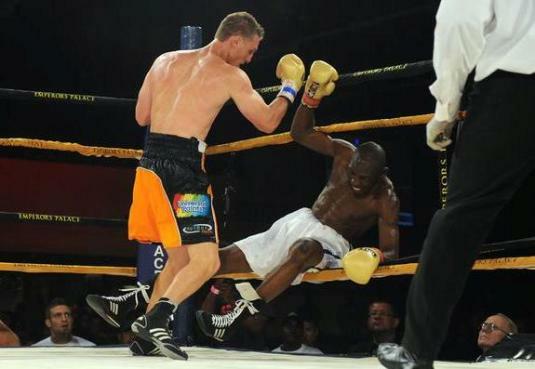 ATJ: Is there enough money in boxing in South Africa? RL: If you are winning then yes of course there is. I am fortunate that I have Saf-fa and Universal paint as a sponsor, so that helps as well. The more you win the more money you will start to make. ATJ: Thanks very much Ryno. I appreciate it. And good luck with the training for the next fight! 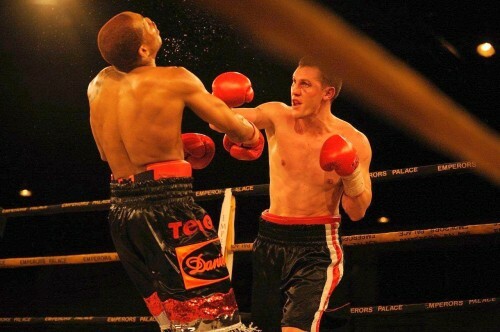 Follow Ryno Liebenberg on Twitter and get supporting South African boxing!